Pinecrest home sales were brisk in December. There were 20 closings of homes in Pinecrest, ranging in price from $270,000 to $3,998,000. Don’t let the lowest priced sale fool you. The average sales price in Pinecrest was $1,148,100 with the median being $805,000. The last time I posted was 3 weeks ago. I know, I know, posting twice a month to a real estate blog is not really doing anyone any favors. I am working on being more consistent, but the bottom line is, if it’s a choice between working or posting to my blog, the work wins (although the truth is, if it were left to whim, the blog would win, but a girl’s got to set some priorities, right?). So what’s been keeping me so busy? I’ve still got my Sellers and Buyers (yes they are capitalized on contracts and on my blog) and now I am running full steam ahead with bank owned property listings. Bank owned properties (or REO’s which stands for Real Estate Owned – a term used by banks to refer to their housing inventory) are homes which the bank has foreclosed on and now find themselves in the unsavory spot of having to do something with…namely get rid of them and not lose their shirts in the process. In Miami and throughout the nation, many, many adjustable mortgage loans have been “adjusting” and in the process folks are finding themselves in mortgages they can no longer afford. They default on the loan and the bank starts the foreclosure proceeding. If the homeowner can’t keep up (or chooses not to) keep up with the payments they will be foreclosed on. By the time banks foreclose on properties most homeowners have vacated the home. But sometimes they haven’t (or have unsuspecting tenants in there) and then eviction proceedings start. Once the property is empty, the bank can concentrate on getting it sold. We’ve been seeing lots of corporate and bank owned real estate listings on the MLS since last year but lately the volume is growing by leaps and bounds. Something else we’ve been noticing is that the banks are pricing aggressively. Simply put, they price it cheap so it will sell NOW. Many factors are involved in the pricing of properties for a regular sale. It’s not any different for foreclosed properties. With the banks knowing that there are other banks out there pricing low to sell, they have no choice but to do the same. And please don’t think that this is happening only in blighted areas, or areas with a huge inventory of new construction bought by investors who haven’t been able to flip them. The very same thing is happening in luxury markets and established neighborhoods such as Coral Gables, Pinecrest, Palmetto Bay and others. It’s happening to varying degrees in just about every neighborhood. So what does this mean to you? Well, that depends. If you are a Seller, it means you better be very motivated to sell. This is no time to be “testing the waters” to see if your custom home will sell at that price you have set in your head. It won’t. Speak to a knowledgeable real estate agent and get the truth about your competition. If there are bank owned homes in the area and you really don’t need to sell your home now, don’t put it on the market. You will only be competing with banks who have no emotional attachment to a property. Their only goal is to sell it, and most times, sell it in 30 days or less. The best way to do that is for them to price it below other similar homes. And they do. **The first one that made me flip was a 3/2 house in the Redland sitting on just over a true acre (which is 43,560 SF, not the acre wannabe known as a Builder’s Acre which only has 30,000 SF) with a 30? x 40? greenhouse with full workings inside, as well as a separate 20? x 30? poured concrete pad that was about 12 inches thick (did you know concrete price is determined by the thickness they pour? Twelve inches is about 3 times more than the cheapest out there), sprinklers throughout the acre, fully fenced and the piece-de-resistance that made me go ga-ga… a 30? x 40? half-grotto/half-paradise gardens which had been carved into the limestone beneath. I could see that whoever had carved this out had done so lovingly and with a definite goal in mind: to create something of beauty that would offer tranquility and the ability to get away from the rush of the everyday right in their own backyard. Steps had been carved in the stone leading to lower levels. Paths were carved which took you around the resulting project. Planters carved out of rock were filled with palms, still healthy yet waiting for someone to come and enjoy them again. There was a carved bench where I could picture sitting and enjoying the Koi which were surely planned for the lowest level carved out of the rock. One of the people I showed this home to suggested filling this “hole” in with dirt and I secretly cringed inside. It was blasphemy to me. Someone had spent a considerable amount of time, effort and probably money creating this. I could see the vision. All this was offered at a price of $250,000. An acre in the Redland without a home on it, presently sells for anywhere from $180,000 to $220,000, depending on the location. this home is located more in the higher range. So you were basically getting the home and everything else for about 30 grand. It sold in 12 days. Yes, even in this market. **I saw a 2/2 townhome in Homestead which had originally sold for $205,000 two years ago on the market for $105,000. Most regular sellers are trying to get $160K for theirs thinking that taking a hit for $45,000 is a big deal (and it is) and along comes a bank and puts one on the market so far below theirs that they are forced to just wait ’til the bank-owned one sells and hope that another one doesn’t pop up. Good luck. 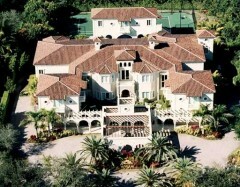 **Yesterday I saw a gorgeous estate home in Palmetto Bay sitting on a lot of over 15,000 SF. The home itself has over 3400 SF of living space, 4 bedrooms, 3 baths, a desirable hidden 2-car garage, a swimming pool and hurricane shutters. The inside is a bit dated with original dark wood kitchen that would more than likely be renovated by new owners, but right now is usable. The home is listed in the low $400’s in a neighborhood where other homes are listed between $600,000 – $899,000. Momma didn’t raise no fool. I know a bargain when I see one. This home is a steal, even with the small repairs it needs. I have to apologize to my 7 (he he) loyal readers for not writing in ten days. This blog truly is kept up by me and not a ghost writer. Yes, believe it or not there are real estate bloggers out there who aren’t really writing their own stuff. Gasp! Anyway, I am not here to trash those agents who would go against the nature of blogging and hire their writing out. Nor am I here to claim that blog purists insist “you’re not a blogger unless you’re doing your own blogging.” Whatever. If anyone thinks the market is changing in Miami-Dade county I’d like to present this visual. It is changing, but not for the better, it seems, at least in this price point. This graph represents homes for sale in Miami-Dade County vs. Homes Sold. I limited the data to homes in the 300K to 400k range. Notice the change in the figures for last month. The inventory of homes for sale went up while the number of homes sold that month went down in comparison to the month before. These figures illustrate how important it is to price your home correctly. The inventory home sellers are competing with is increasing while the available buyers is decreasing. If you need more information on pricing your home for sale, please contact me for a free, no-obligation market analysis of your home’s value. I am here to help you with your real estate needs.